Take Action: Support Chaw Sandi Tun from Myanmar and Tair Kaminer from Israel with your emails! has been sentenced to six months’ imprisonment in connection with a Facebook post mocking the army. She was arrested in Yangon and transferred to Maubin prison, where she remains behind bars. Support Chaw Sandi via your protest email here. Tair Kaminer, 19-year-old activist from Israel, has been imprisoned for 20 days for her refusal to join the Israeli military this month. Support Tair via your protest email here. We are working on creating an interactive map of conscription, and the way conscientious objectors are treated in different countries. This will be part of the “World survey of conscription and conscientious objection to military service” project. This interactive map will make information on conscription and objection more accessible and more clear visually, so it may be used for campaigning as well as research. We have started collecting information through a questionnaire, but still missing contacts in many countries. 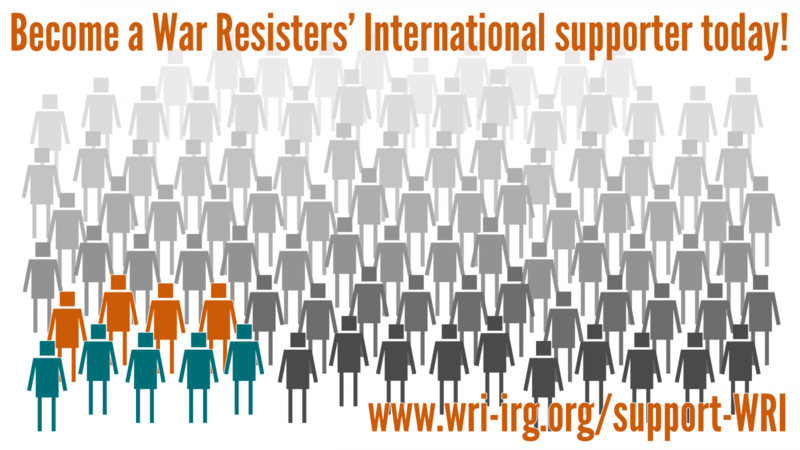 If you have the relevant information on one of the following countries, please email taya@wri-irg.org: Algeria, Burkino Faso, Cambodia, Comoros, Dominican Republic, Gambia, Honduras, Jamaica, Liechenstein, Malaysia, Myanmar, Samoa, Suriname, Trinidad and Tobago. A series of events on nonviolence is running throughout January in Sevilla, state of Spain. The event this evening will launch the 'Manual para Campañas Noviolentas' – the Spanish edition of the Handbook for Nonviolent Campaigns. On Saturday, attend the Workshop Design of Nonviolent Campaigns, led by former WRI staff member Andreas Speck. Register here. Israeli conscientious objector Taya Govreen-Segal, currently interning in the WRI office in London, is speaking at various events over the coming weeks around Britain. %20">Britain and Palestine Conference, Sailsbury (talk on the Israeli arms trade). Researchers from the Satyagraha Foundation have spent the last 18 months researching the War Resisters' International archives in Amsterdam (held at the International Institute of Social History). Among other things, they unearthed such treasures as an unpublished text from Tolstoy, materials on the French resistance, and previously unpublished Gene Sharp essays. Their research is now finished. If you are interested, have a look at their website here.